On Monday night, the City Council moved to suspend Calhoun Fire Chief Lenny Nesbitt for 30 days without pay following an investigation into his arrest. On Nov. 10, Nesbitt was arrested by the Georgia State Patrol in Fannin County on charges of DUI and failure to maintain a lane. The charges against Nesbitt were resolved by the Blue Ridge City Court on Dec. 10 without a conviction, according to a December news release from the city. City Administrator Eddie Peterson put Nesbitt on administrative leave indefinitely on Dec. 20 following the discovery of his arrest. The investigation was conducted by the Calhoun Police Department and reported to the city. City Attorney George Govignon said the CPD report details will be released to the public soon but did not state a specific date. The suspension for Nesbitt begins immediately. At the end of the 30-day suspension, he will return to work, but will be on a six-month probation period, as was determined by the council on Monday following an executive session. According to Ryan Powell, the deputy executive director of the Georgia Peace Officer Standards and Training Council, Nesbitt did not report his arrest to the regulatory body for peace officers within the required 15 days of the incident taking place. Normally POST does not deal with fire departments, but Nesbitt's case is different, since he was officially a peace officer, he explained. Four days after his arrest, Nesbitt notified POST he was choosing to give up his certification as a police officer. regarding his arrest and the disciplinary action decided upon by the City Council. Also at Monday's council meeting, members renominated George Crowley to serve as the Mayor Pro-Tem for 2019. The Fiscal Year 2018 financial audit was approved as well as the budget calendar for the Fiscal Year 2019-2020. The 2018 audit, presented by Assistant City Administrator Paul Worley, reported that 2018 was a successful year for the city both operationally and financially. Worley also reported that the city was able to write off the remaining debt of the Fields Ferry Golf Club, saying that the city golf course is now in a net positive position for the first time in over 10 years. Mayor Jimmy Palmer reminded the council that 2019 was an election year for Calhoun, with the mayor seat, two city council posts and two school board posts up for election. The council approved qualifying fees for each of these positions — $432 to run for mayor, $252 to run for city council (posts one and two) and $1 to run for the city board of education (posts four and five). The council also approved for the Wall Street Grille (doing business as Southern Roads Cafe), Calhoun Drug Company and Fred's Stores of Tennessee to extend their liquor renewal requests. • Prior to his swearing in, Gov. Kemp tours across Georgia to reassure he will represent Georgians first. During Saturday's event in Dalton, where Governor Brian Kemp was visiting with local people and politicians, Carpet and Rug Institute Joe Yarbrough (left) presents the Governor with a specialized rug for his new office in State Capitol. Newly inaugurated Governor Brian Kemp (navy jacket) stands with his spokesperson Candace Broce (white shirt) while attending his final pre-inauguration event in Dalton on Saturday. Gov. Brian Kemp visited Dalton this weekend during a part of his per-inauguration tour, where he traveled across Georgia. From Jan. 9-12, Kemp visited eight different cities across the state, hosting events such as a military appreciation breakfast, an event honoring current first responders and law enforcement officers, and a ceremony to recognize Gov. Nathan Deal. On Saturday at the Dalton Golf & Country Club, Kemp thanked local politicians, residents and members of the Republican Party who supported him. "We wanted to make sure we got up here to say thank you to everyone and let them know I'm going to be a governor who's working for our whole state, all four corners and everywhere in between," Kemp told the press during the event. In preparation for his inauguration, Kemp wanted to make sure that the citizens of Georgia know their stories won't be forgotten, and he fully intends to represent every Georgian, he said. He also said it was encouraging to have the support of the presidential administration during the November elections. Sen. Chuck Payne, R-Dalton, and House Rep. Jason Ridley, R-Chatsworth, introduced Kemp to the podium on Saturday, expressing their support for the then governor-elect. "This is such a hopeful time. Let this be the day people say hope was restored in the state of Georgia," Payne said. "It's not just about Brian Kemp or Geoff Duncan, it's not just about those of us serving in elected office, it's about everyone in this room." Ridley said that Kemp will be for the people of Georgia, and the representative is confident the new governor will consistently put his citizens first. "He's the same every single day," Ridley said. "He can go down to somebody's house, rich or poor, and have a cup of coffee and relate to them because he's been there. I can't be prouder of him." Both Hood and Hall think Kemp will be a great governor for the state, specifically due to some of his proposed ideas regarding education, taxes and religious freedom. On Monday at Georgia Tech's McCamish Pavilion, Kemp was officially inaugurated as Georgia's 83rd governor, where he also swore in the 12th Lt. Gov. Geoff Duncan, as well as other constitutional officers. "With unprecedented growth and unmatched opportunity, it is a great time to be a Georgian, but we didn't get here alone," Kemp said during the swearing-in ceremony, acknowledging state figures such as Martin Luther King Jr., Supreme Court Justice Clarence Thomas and UGA Coach Vince Dooley. "Many went before us and charted the course." Kemp also said on Monday he sees a bright future for the state of Georgia, thanks to the hard work of previous governors, namely Sonny Perdue and Nathan Deal. "Georgia is the epicenter of job growth, the Hollywood of the South and soon to be the cyber capital of the world," said Kemp. "As governor, I will work everyday to keep Georgia moving in the right direction. My vision is for a safer, stronger state. I know it can be done." 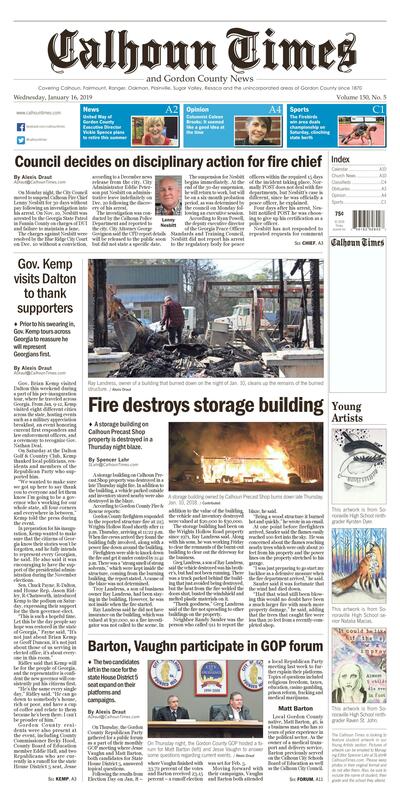 • A storage building on Calhoun Precast Shop property is destroyed in a Thursday night blaze. Ray Landress, owner of a building that burned down on the night of Jan. 10, cleans up the remains of the burned structure. A storage building owned by Calhoun Precast Shop burns down late Thursday, Jan. 10, 2018. A storage building on Calhoun Precast Shop property was destroyed in a late Thursday night fire. In addition to the building, a vehicle parked outside and inventory stored nearby were also destroyed in the blaze. Gordon County firefighters responded to the reported structure fire at 215 Wrights Hollow Road shortly after 11 p.m. Thursday, arriving at 11:22 p.m. When fire crews arrived they found the building fully involved, along with a power line down around the building. Firefighters were able to knock down the fire and get it under control by 11:41 p.m. There was a "strong smell of strong solvents," which were kept inside the structure, coming from the burning building, the report stated. A cause of the blaze was not determined. Troy Landress, a son of business owner Ray Landress, had been staying in the building. However, he was not inside when the fire started. Ray Landress said he did not have insurance on the building, which was valued at $30,000, so a fire investigator was not called to the scene. In addition to the value of the building, the vehicle and inventory destroyed were valued at $20,000 to $30,000. The storage building had been on the Wrights Hollow Road property since 1971, Ray Landress said. Along with his sons, he was working Friday to clear the remnants of the burnt-out building to clear out the driveway for the business. Greg Landress, a son of Ray Landress, said the vehicle destroyed was his brother's, but had not been running. There was a truck parked behind the building that just avoided being destroyed, but the heat from the fire welded the doors shut, busted the windshield and melted plastic materials on it. "Thank goodness," Greg Landress said of the fire not spreading to other buildings on the property. Neighbor Randy Sauder was the person who called 911 to report the blaze, he said. "Being a wood structure it burned hot and quickly," he wrote in an email. At one point before firefighters arrived, Sauder said the flames easily reached 100 feet into the sky. He was concerned about the flames reaching nearby trees which were only about 20 feet from his property and the power lines on the property stretched to his garage. "I was just preparing to go start my backhoe as a defensive measure when the fire department arrived," he said. Sauder said it was fortunate that the wind had died down. 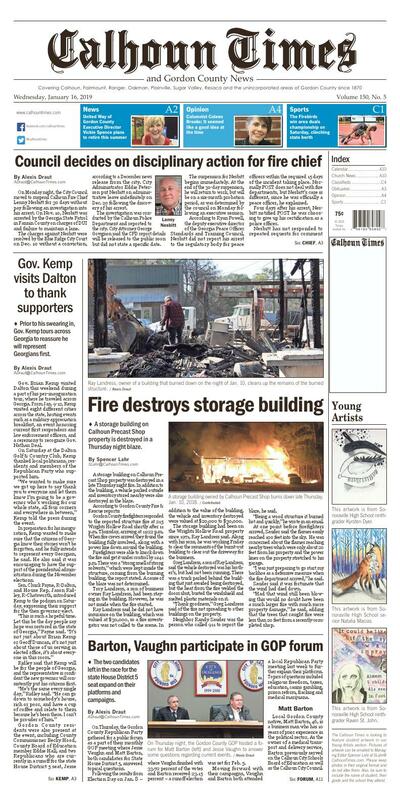 "Had that wind still been blowing this would no doubt have been a much larger fire with much more property damage," he said, adding that the trees that caught fire were less than 20 feet from a recently-completed shop. • The two candidates left in the race for the state House District 5 seat expand on their platforms and campaigns. On Thursday night, the Gordon County GOP hosted a forum for Matt Barton (left) and Jesse Vaughn to answer some questions regarding current events. The Calhoun Depot was full of Republican Party members and the two candidates left in the race for House on Thurdsay night during their public forum. Matt Barton (left) and Jesse Vaughn were the two candidates out of the six running for House that moved on to the run off on Feb. 5. At the Gordon County Republican Party forum, signs promoting Jesse Vaughn for state House were set up in truck beds of those attending the meeting. On Thursday, the Gordon County Republican Party gathered for a public forum as a part of their monthly GOP meeting where Jesse Vaughn and Matt Barton, both candidates for State House District 5, answered topical questions. Following the results from Election Day on Jan. 8 – where Vaughn finished with 33.72 percent of the votes and Barton received 23.15 percent – a runoff election was set for Feb. 5. Moving forward with their campaigns, Vaughn and Barton both attended a local Republican Party meeting last week to further explain their platforms. Topics of questions included religious freedom, taxes, education, casino gambling, prison reform, fracking and medical marijuana. Local Gordon County native, Matt Barton, 46, is a business man who has 10 years of prior experience in the political sector. As the owner of a medical transport and delivery service, Barton previously served on the Calhoun City Schools Board of Education as well as the Calhoun City Council. At Thursday's forum, Barton said he was also in favor of giving teachers raises, keeping taxes low, maintaining religious freedom and against legalizing casino gambling. "I think (legalizing gambling) is a slippery road and it can increase crime and unwarranted things in the area," Barton said. "I wouldn't be in favor of that, at least not at this time." Barton views medicinal marijuana in the same light, saying if it's legalized in the state, it would have to be heavily regulated. When the candidates were asked about their opinions regarding fracking, Barton said from his understanding, Georgia was a good location for fracking, but he appreciated the work the late Rep. John Meadows did on regulating fracking. Barton is supported by his wife and two daughters during his campaign and pledges to continue to educate himself through training the state may offer or personal political research if elected to the House. "I want to serve our community in this district," said the conservative Gordon Central graduate, who refers to himself as "a financial tightwad." "I'll be there for you, and I'm always able to reach. I'll be there to keep your taxes low and keep the government out of your hair." When Meadows died in November, opening up a seat in the Georgia House, Jesse Vaughn, 45, was contacted and asked to run by the Meadows family, community members and even Georgia Speaker of the House David Ralston, he said. Following this "calling" to run for House, Vaughn believes his career as a lawyer gives him an edge on the other candidates and would qualify him to be an excellent representative for the house. Vaughn is passionate about being pro-life, pro-Georgia and pro-America. The lawyer also said at the forum that he is for religious freedom, for lowering taxes, giving teachers raises and against legalizing casino gambling. "We need to protect our property owners and our beauty but also help the environment," Vaughn responded to a question on fracking. "It's much better to have a thoughtful set of rules in place to say there absolutely can't be any fracking or have no rules and just let it be the wild west." Vaughn, a longtime friend of the Meadows family, admires the work Meadows did to regulate fracking in the area, he said. Also during the forum, Vaughn expressed similar views as Barton regarding marijuana, that while it might be useful for medical purposes, it would have to be heavily regulated if legalized in Georgia. "I have been a lawyer here for 20 years and in that I have worked to help people solve their problems," Vaughn said. "Honestly I think that's the biggest part of a state representative's job and that's what I love to do." After the forum was concluded, Barton and Vaughn commented on how they felt about their answers and their campaigns moving forward. Barton thought the forum went well from his perspective, and though some of his answers were shorter than Vaughn's, he prefers to be straight to the point. "I'm more of a short and sweet kind of guy. I don't like to elaborate too long," said Barton, commenting on how the first part of the election seemed to fly by but now it's slowing down with only two candidates left in the race. Vaughn also felt the forum went well and he is happy to still be in consideration for the seat. Though he is excited, he also knows there is still a long ways to go until the Feb. 5 runoff election. "We know Feb. 5 is a new day and we've got to continue working and reaching out to people, connecting to people and getting across that finish line," Vaughn said. "We have a canvassing plan we're implementing to go around and talk to people (in the district)." Gordon County Commissioner Becky Hood, who is friends with both of the candidates, has stayed up to date on the special election even though she doesn't live in District 5 and will not be able to vote on Feb. 5. "I thought Jesse's answers were wonderful. He has a lot of history and he gets the business (of politics)," Hood said. "I thought in that forum, Jesse was the clear winner." As an elected politician heavily involved in Gordon County, Hood encouraged voters to do their research before voting in the runoff. "I would say the citizens need to look closely at the votes that have been made by the candidates, I would take a close look at their life choices, things they've done for the community and their relationships with state representatives," Hood said. Those eligible to vote in the special election runoff on Feb. 5 must be registered in the following precincts: 1055 Plainville, 1064 Oostanaula, 1054 Sugar Valley, 980 Resaca, 1063 Pine Chapel, 849-A County/Belmont, 849-B City of Calhoun and 856 Lily Pond. Also, only the voters in the 973 Red Bud and 1056 Sonoraville precincts who live in House District 5 can vote in the special election. The Oakman and Fairmount voting precincts are not included in the special election. This artwork is from Sonoraville High School senior Natalia Macias. This artwork is from Sonoraville High School ninth-grader Raven St. John.